The story of the legendary scrapyard of Woodham Brothers at Barry, South Glamorgan is a truly remarkable one, that involves so many sets of circumstances that would make a great novelist proud. The man who fostered the legend, Dai Woodham, became a name familiar with steam enthusiasts and preservationists alike. Born in 1919 as David Lloyd Victor Woodham, young Dai helped run the family's docks portering business set up by his great grandfather around the turn of the century. Barry had been developed as a major port for the export of coal due to the fact that Cardiff, the main port of export, could not cope with the vast quantities being shipped. Such was the success of Barry Docks that it still holds the record for the amount of coal exported in one year - 11 million tons in a single twelve month period. Unfortunately, Barry suffered the 'boom and decline' ravages of the declining coal industry and the depression years of the early part of the 1900's, and its trade changed to include other imports and exports. From young Dai's dealings with ships of many nationalities coming to Barry, he picked up three languages fluently. In the late 1930's, Woodham's interests turned to road transport and scrap, but it was not until 1957 that the company began dismantling railway wagons as a result of the 1955 Modernisation Plan which sought to reduce British Railways wagon fleet from 1¼ million to just 600,000 and to scrap 16,000 steam locomotives. The scrapping of that quantity of wagons by itself was set to transform the family business by providing a seemingly never-ending flow of material, however with the large number of scrapyards in the South Wales area, nobody was quite sure how long the wagon contracts would last. The replacement of the 16,000 steam locomotives was obviously a fundamental change of direction for British Railways and was going to take some time to implement. At first progress was limited to the replacement of those older steam designs employed on shunting and light branch duties as suitable diesel shunting locomotives and the first generation of diesel multiple units were already available for traffic, while a successful fleet of large main line engines still had to be designed and built. By 1958 a re-appraisal by the British Transport Commission resulted in the decision to accelerate the disposal of the steam fleet, despite the fact that many of the BR Standard Class 9F 2-10-0's had yet to be built. This far-reaching decision soon led to large groups of condemned locomotives arriving at the major BR works for cutting-up and frequently the yards at the works could not cope with storage of such an enormous quantity of engines. Consequently, dumps of withdrawn locomotives began to appear in adjacent sidings or nearby closed branch lines. Within a very short time the rate of withdrawals was outstripping the capacity of the main works to dispose of them. 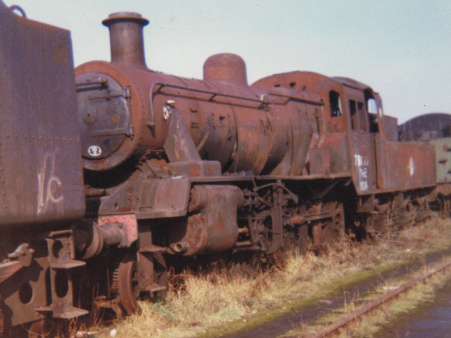 So, it was decided to put out to tender the majority of locomotives to the private scrapyards in an attempt to clear the backlog at the works and its maiden customer became Woodham Brothers of Barry. "I went to Swindon Works for a week in 1959 to 'learn' how to scrap a steam locomotive," Dai commented. "It was a completely different job from what we were used to ." On the 25th of March 1959, the first batch of engines was despatched to Barry - GWR 2-6-0's numbers 5312/60/92/97 and a single 2-6-2T Prairie tank, 3170 a week later. Although the number of locomotives bought by Woodham's was comparatively small at this stage, the size of the deliveries increased and between November 1960 and April 1961 alone, 40 locomotives were acquired from Swindon. 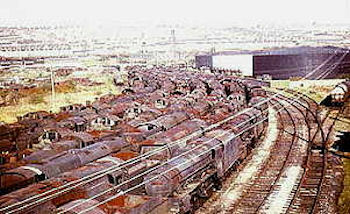 Most but not all of these engines were scrapped soon after their arrival, but as the number of deliveries increased, additional storage was found at the low-level sidings adjacent to the oil terminal and also on sidings built on the site of the former West Pond which had been filled in as part of a land reclamation scheme. These additional sites were required for the number of Southern Region engines that Woodhams began to purchase from mid-1964. During 1965, 65 locomotives arrived at the Barry scrapyard, however, in the first six-month period 28 engines were dismantled but cutting virtually ceased from the autumn onwards as the scrapmen concentrated instead on breaking up yet more freight wagons and brake vans. Thus the 'second' Barry story was developing. Dai readily confessed this had nothing to do with any personal emotions for steam - it was simply that wagons were easier to cut up - and the supply at this stage was seemingly endless, but it was felt that once the wagon fleet had been reduced to a certain level, disposal would ease off. Therefore, Woodham's kept the locomotives 'for a rainy day' for when this slack period arrived. What no one realised at the time was the immense impact the introduction of mechanised handling was going to have on industry and its 'knock-on' effect on the rail system. Containers, pallets and fork lift trucks all favoured road haulage. Coupled with a Government policy to extend motorways which were needed to handle this traffic, all led to an ever decreasing requirement for rolling stock. Even the freight wagons that BR intended to keep in the Modernisation Plan, had to be replaced with more efficient vehicles carrying block loads. At one time Woodham's sidings were filled with wooden bodied coal trucks as they were replaced by steel sided mineral wagons and even as late as 1987, the cutting yard was filled with BR Standard brake vans - no longer required on the fully fitted freight trains of today. 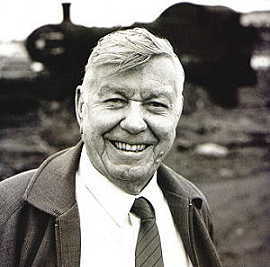 Dai Woodham continued to purchase further locomotives until the end of steam in 1968 with many of the later deliveries being of the BR Standard designs. Altogether from 1959 until 1968, 297 locomotives were bought by Woodhams, however by August 1968, 217 remained at the Barry scrapyard. It was at this time that steam locomotive enthusiasts realised that they had to be content with the National Collection accompanied by a relatively small number of privately-purchased locomotives such as 'Flying Scotsman', 'Clun Castle' and the Bluebell Railway fleet, for example, but many classes had already become extinct and the only other source of steam engines for the future was to be this new phenomenon at Barry. The railway preservation boom began.